Think about a time when you have been worried, anxious, or stressed. Some people turn to art to relieve these feelings. Adult coloring books are a new trend, some of which are marketed to lower stress. Now, think about the amount of worry, anxiety, and stress one might feel after a stroke. Strokes can cause motor, sensory, cognitive, and communication deficits that impact the way you walk, talk, and live. Physical, Occupational, and Speech Therapy are often immediately involved after a person has had a stroke. These therapies focus on restoring the physical, cognitive, and communicative aspects of a person’s life after a stroke with the goal of reintegration into functional activities. There is another type of therapy, however, that may be lesser known than PT, OT, and Speech. According to the American Art Therapy Association, art therapy is “an integrative mental health and human services profession that enriches the lives of individuals, families, and communities through active art-making, creative process, applied psychological theory, and human experience within a psychotherapeutic relationship.” Benefits of art therapy can include reduced stress, better self-esteem, improved emotional health, and lower depression. Art therapy involves working with a trained professional, in a clinical setting, or art studios. 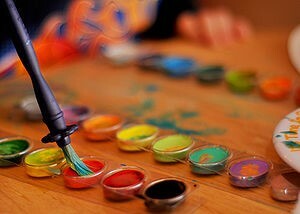 Sometimes, art therapy is completed individually or can be completed in a group. Some art therapy groups can also serve as a type of support group, with a goal of healing. Art therapy groups after a stroke have been beneficial in helping people cope with feelings of loss. Interestingly, it has been found that just an appreciation of art, music, and other creative pathways can be helpful in the recovery process after a stroke.